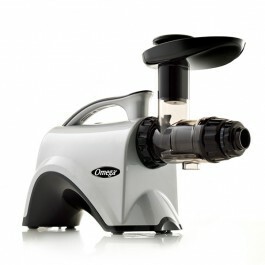 Omegaâ€™s Nutrition Centers are â€œmasticating-styleâ€ juice extractors and more! A masticating juicer juices at low speeds of 80 RPM minimizing heat build-up and oxidation. The auger system forces produce into a tight chamber, grinding and pressing the food to squeeze out the juice from items as fine as wheatgrass and leafy vegetables. With a Nutrition Center you can also make all-natural nut butters, baby food, soy milk, almond milk and a variety of healthy snacks. NC800/900 compared to the 8006: The size of the feed chute is larger so you spend less time prepping before juicing. The adjustable end cap with 5-settings increases juice extraction efficiency. Use setting 1 for citrus fruits and setting 5 for tougher items like wheatgrass.